Ali grew up in Redmond Washington, where she attended Redmond high school. She played many sports in high school including basketball, soccer, and cross county. Ali attended college at Oregon state university graduating with a degree in digital communication arts and a minor in environmental science. She continued to play basketball on a recreational level as well as coaching different teams and camps. She worked at the recreational center at OSU as a group fitness instructor and feel in love with helping people pursue their healthiest lifestyle. With a wide range of passions, she also enjoyed being a radio DJ for KBVR FM at OSU. After getting through two ACL tears and rehab with the help of LWPT, Ali discovered more of an interest in PT. Besides work, Ali loves to stay active outside by hiking, biking, and running. She also loves to travel and experience different cultures. Zach grew up in Bothell, Washington where he attended Inglemoor High School. He has been an avid basketball and tennis player since childhood, playing competitively through high school as well as coaching both. The experience he gained working at Home Court, a local non profit organization that runs youth basketball camps, led him to pursing his bachelors in Kinesiology at Western Washington University, as well as a minor in Sport Psychology. Since graduating from college he has attained his personal training certification and has been working as a personal trainer, and as a program director at Home Court. 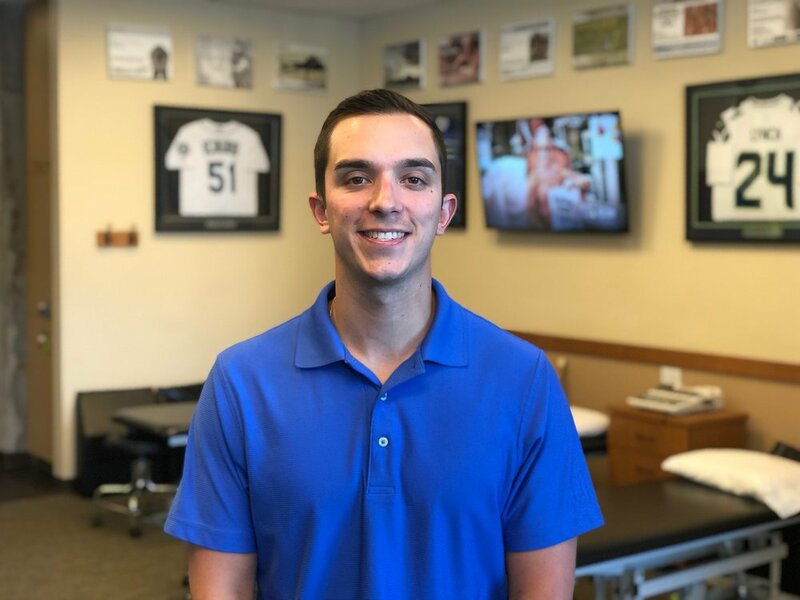 His interest in physical therapy came from a desire to do more for some of his personal training clients who required more than his skill set could offer. In his free time Zach enjoys spending time outdoors, watching professional sports, as well as, playing video games, and reading. Mia grew up in Bellevue and attended University Prep for high school. She played soccer and softball for U-Prep and also played for Lake Hills club select soccer for several years. Mia’s interest in PT developed from a rehab experience she had at LWPT while she was still in high school, which led her to study health and exercise science at Syracuse. Since graduating in 2016, she has spent time working seasonally, spending two summers in Grand Teton National Park in Wyoming, and a winter ski instructing in Vail, Colorado. She has continued working as a children’s ski instructor on weekends at Stevens Pass, where she enjoys teaching kids where she herself learned how to ski. In the summer months, you can find Mia on a hiking trail or on a lake kayaking, enjoying the outdoors. She also enjoys traveling and has even spent time volunteering in a PT clinic in Kathmandu, Nepal. Mia is working towards going to physical therapy school and hopes to incorporate her love for the outdoors and traveling, in addition to helping others, in her future career. Wendell grew up in Bothell, WA where he attended Bothell High School. He first developed his interest for physical therapy in high school after injuring his ankle playing football. He continued to play in college at Willamette University in Salem, OR, where he recently graduated with a degree in Exercise Science. Aside from sports, Wendell has developed a passion for the outdoors over his years spent in Oregon.Wendell is now enrolled at PIMA's physical therapy assistant program in Seattle. Rachel grew up in Redmond,WA where she attended Redmond High School. She was a very avid volleyball player and loved being very active. She attends the University of Washington and is majoring in Food Systems, Nutrition, and Health. She got passionate about Physical Therapy when she got three concussions in four months and couldn’t go a day without symptoms for many months. The Physical Therapists at Seattle Childrens helped her get back to her normal life and Rachel wants to help other people going through the same exprrience. Rachel loves running, volunteering at her Church, nannying, and coffee. She is currently taking classes at UW to apply to a PT program next year. Cameron grew up in Redmond, Washington and attended Lake Washington High School. His interest in physical therapy began in middle school after a minor knee sprain. Cameron observed Matt Sato and Ben Wobker at Redmond Physical therapy for his LWHS senior project, which confirmed his interest in studying Kinesiology at PLU. He has played soccer his whole life on teams including LWHS, Crossfire, NW Nationals, and PLU until he suffered two ACL ruptures during his freshman and sophomore years in college. Cameron is now enrolled at PIMA's physical therapy assistant program in Seattle. Kristin grew up in Woodinville and then attended Western Washington University in Bellingham. She is currently a senior studying kinesiology and exercise science. Kristin has had great experience with exercising dogs at both Paradise Pet Lodge and through Rover.com. Kristin fits right into our team as she has meaningful volunteer experience at both Tent City, Relay for Life, as well as a pivotal role at Kindering’s annual auction. Nicole grew up in Shoreline, Wa where she attended Shorecrest High School. She participated in many sports growing up including soccer, horseback riding, cheer, track & field, and cross country. She attended Santa Barbara City College for two years then transferred to Western Washington University to study Psychology and Sports Psychology. Nicole became interested in physical therapy after suffering multiple sports related injuries and wanted to help other return to their favorite activities like her Physical Therapists helped her. In her free time she loves running, trying new coffee shops, and exploring new cities. She is currently taking classes and gaining experience in order to apply to a PT program.